You are here: Coupons/Deals » General Coupons » Health & Hygiene » $5 off Nature Made Vitamins Printable Coupon!!! 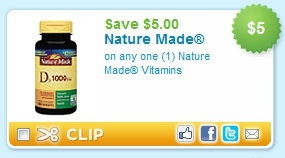 $5 off Nature Made Vitamins Printable Coupon!!! UPDATE: The coupon has reached the print limits, we will re-post this when it becomes available again. Super HOT $5/1 Nature Made Vitamins Printable Coupon enter zip code 93035it’s under “Healthcare” and you can print 2 coupons! . Often times many of stores including Walgreens, Target and Grocery Stores will have Nature Made Vitamins for Buy One Get One FREE at $10, which will make these FREE using two $5 coupons. Also be sure to check out Target for Nature Made Vitamins on sale for $5 -$7, making these as low as FREE after the coupon!! I use 8 different Nature Made supplements so this coupon excited me to all mighty heck! But it’s no where to be found at this site. I’ve gone through every coupon at least 5 times and have used other zip codes and still have not found it! I did see the $1 off coupon but not the $5 off one. Why? If anyone can tell me how to find it PLEASE DO! That’s a big savings for me since I use this brand! I can’t find it either! 🙁 Like Mary (comment next to mine) I use at least 5-6 supplements daily and this would be a great help to me. If someone finds it please let us know. Thank you!